Is there anyone out there, ‘cos it’s getting harder and harder to breathe? dizzy – I didn’t think the jump from 2800m to 3400m altitude would rattle me as much as I did, but I felt lethargic, not speaking normally, not responding to questions, and struggled to make it through my meal. wet – my LAN Airbus A319 failed at its first attempt at landing in Cuzco and had to try again. It was quite unnerving hearing the engines fire up to full throttle at the last minute before the expected landing, in the middle of a cloud, when you are flying through the Andes, which incidentally is littered with mountain peaks 3000m higher than the airport we were attempting to land at. That should give some indication of the weather in Cusco. tired – I had barely slept the night before, largely thanks to a usually noisy ground floor hotel room, coupled with a Friday night party in the lobby which rocked until just after midnight. Then there was the 4am alarm for the 4:30am taxi to the airport. And the three flights that followed. lonely – I had just spent the last eight days with social interaction on tap, suddenly I was thrown into the cold, dark unknown. Thanks to the above-mentioned factors, I was not in a state to socialise. homesick – thanks to all of the above, and a picture a friend threw up on Facebook of a beautiful Queensland beach, I felt for the first time this trip, a jolly big bout of homesickness. 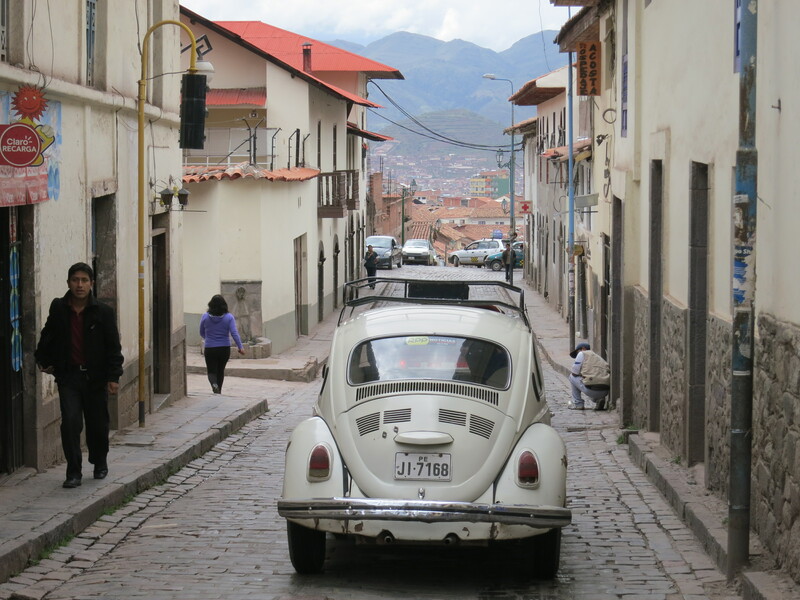 worried – if I remained in this state, how would I ever be able to commence the Inca Trail on Tuesday? So I checked in, watched some Community, went to bed, and slept for a very long time. Thankfully, all these adjectives failed to apply to me when I woke the next morning. I met a German man at an information centre I visited to collect a city map. We got chatting about things, and then out of the blue, his French girlfriend said she was going to book a restaurant for the man’s celebratory birthday dinner the next night. They didn’t believe me when I said my birthday was the exact same day. So I got invited along to Café de la Paz for a delightful birthday dinner. Surprise! 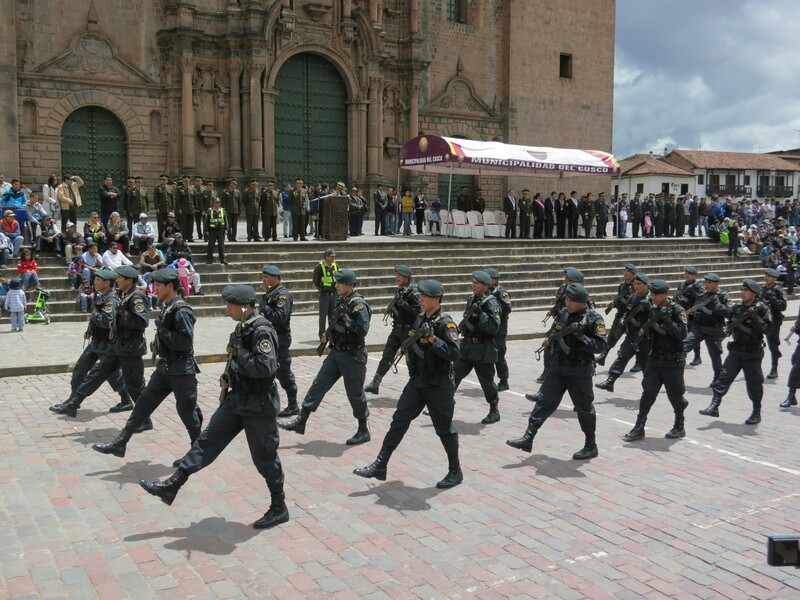 A military parade appears out of nowhere. last minute purchases of important things for mountain ranges that we sub-tropical folk don’t normally concern ourselves with, like warm clothes. It was probably the most unexciting time of the trip thus far. But it was livened up by a night in the hostel bar, where a passionate Californian was quickly drinking a lot of beer. He did so while watching a bunch of men from San Francisco dressed like either 1970’s news anchors or Kevin from Daria (pick your favourite metaphor) play a game of gridiron against another similarly robed bunch of men from somewhere else. The scary part was his sudden and unexplainable flipping from sitting in the corner being quiet as a mouse, to jumping up and down on the timber floorboards, running up and down through the bar screaming things like, “that’s what I’m talking about.” It gave me a little fright every time, because it was always so sudden and unexpected. He acted in unison, and no one quite understood what he was going about because like most American football games, whenever anyone veers their eyes towards the television, there is always an advertisement playing. If his attempt was to rally support, it was an abject failure, any Americans in the room who would otherwise be interested seemingly found him more entertaining than the game itself. On the evening of the 17th, I went to the pre Inca trail briefing, where I met my fellow trekkers. After allaying my fears of soon becoming a rotting corpse on the side of the mountain, I dragged one of them, Michael, who was also starving to the aforementioned dinner. It was much enjoyable, and after the joy of purchasing some alpaca gloves in Ecuador just previously, this time I had the pleasure of eating one. ¡Muy delicioso! 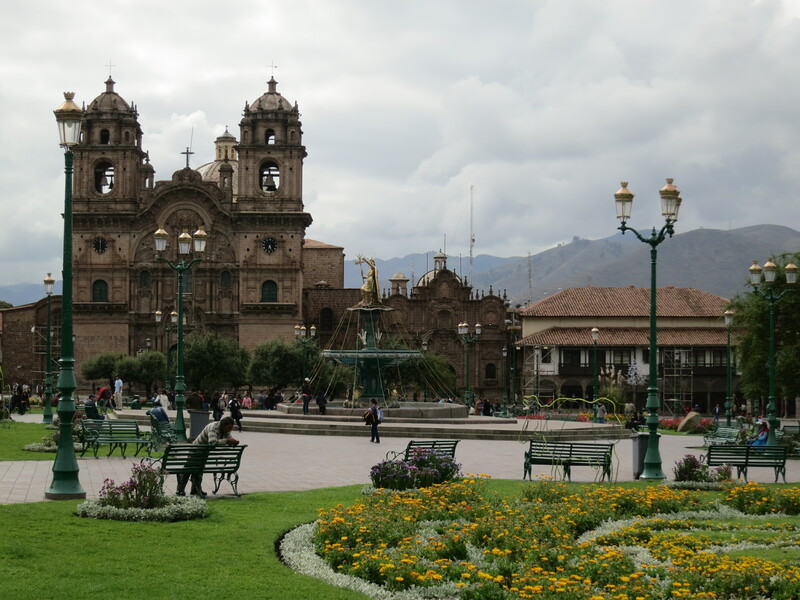 I didn’t really give Cusco a fair run – my trip was rushed and full of errands, and while I enjoyed the sights and smells of San Pedro market and exploring the cobblestoned streets, I didn’t get to enjoy anywhere near all the city had to offer. But at the same time, it is a place overrun by tourists, and it shows. You cannot walk down a street without being invited on a tour or offered a massage for 20 soles ($8), I didn’t enquire about any optional happy endings. But Jack’s Café – best cappuccino in South America, by far.